Apple disabled support for some features in iOS 4 to shoehorn the new release into the processing constraints and memory footprint of the 2008 iPhone 3G and second generation iPod touch. Here's what's missing and why. When running on iPhone 3G, iOS 4 disables multitasking, background wallpapers, Bluetooth keyboard support, and a "data protection" feature. The first generation iPhone and iPod touch can't run iOS 4 at all; those early devices make up less than 10% of the entire number of iOS devices sold (a number that will hit 100 million by the end of June, Apple noted at WWDC). Apple's three years of OS upgrade support for the first generation models compares favorably with other platforms, where devices are often unlikely to ever see an update. For example, Google's Android OS, which has delivered software updates that are at least on par and often better than most other competing platforms, stopped supporting new updates for the original T-Mobile G1 after a single year. The HTC myTouch 3G was released in the US less than six months before Android 2.0 was unveiled, but still hasn't received that release yet, let alone the newest 2.2 update, which is currently only available to users of the Google-branded Nexus One. Even many recent Android phones won't be able to update to the latest Android 2.2 right away once it becomes officially available. 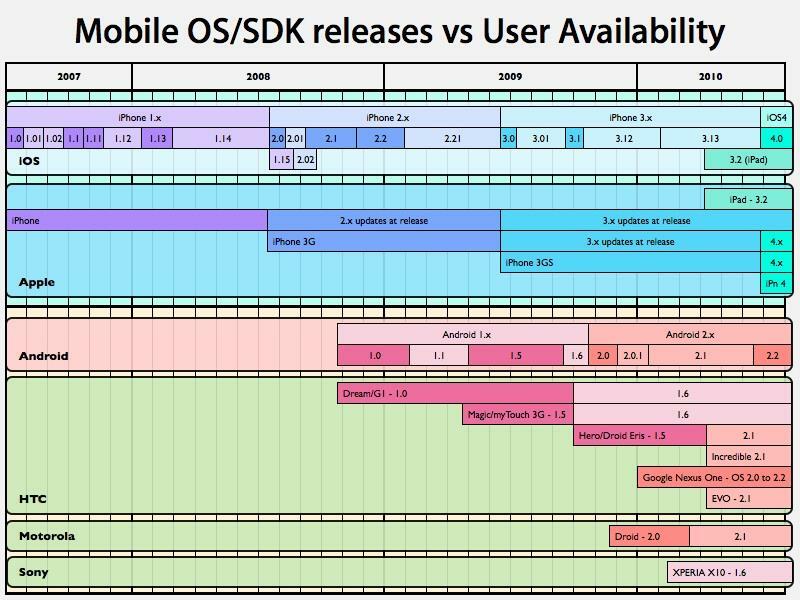 Apple has worked to push all of its mobile users to the latest version of the operating system as soon as possible after its release, making it available as a direct download from iTunes rather than relying upon the various mobile operators to distribute it over the air, as Google's Android, Nokia's Symbian, RIM's BlackBerry, HP's webOS, and Microsoft's Windows Mobile platforms have to do. Deactivated support for iOS 4 multitasking on the iPhone 3G is believed to largely be a product of its limited memory; like the original iPhone, it only has 128MB of system RAM. Unlike the first iPhone, Apple continued to sell the model over the past two years, making its support for iOS 4 critical to moving the majority of the installed base to the latest version of the operating system. Jailbreakers have noted that previous versions of the iPhone operating system could "support multitasking" in the sense of simply working around the app launching boundaries Apple erected. That results in an implementation of multitasking that works more like Android, where there is no effort to regulate how background tasks work in order to conserve battery life. Apple's new multitasking APIs in iOS 4 enable a variety of background operations, state saving, and notification alternatives that together result in better battery life and largely automatic process management that doesn't require users to manually hunt down and kill rogue or unwanted apps in the background. Apple's engineers determined that supporting this more sophisticated level of multitasking on models with less RAM than the iPhone 3GS wouldn't work well, so rather than excluding iPhone 3G users from upgrading, they simply turned off multitasking as a feature so users could benefit from the other improvements to iOS 4 (which as a whole also take up more memory than previous versions of the OS). On page 2 of 2: iOS 4 eats up RAM, No wallpaper, Bluetooth keyboards for iPhone 3G in iOS 4 .